Goodreads Summary: A sweet and clever friendship story in rhyme, about looking past physical differences to appreciate the person (or dragon) underneath. Ricki’s Review: I simply adored this book. It was quite clever and imaginative! I imagine it took a lot of thought to try to show how different George and Blaise’s lives might be and how they might misinterpret the descriptions of simple daily life events. I am a huge fan of Josh Funk’s writing and recommend all of his books. They all are witty and humorous, and my son and I always giggle while we read them. Each of his books teaches a life lesson that has been very useful for me as a mom, and I know they are equally useful for elementary school teachers. For Lady Pancake & Sir French Toast, I have been able to constantly refer to the variety of foods in the text in order to help my son with his picky eating habits. With this book, Dear Dragon, I have been able to talk with my son about differences and how we might work to understand how others might lead different daily lives than ours. I am really looking forward to Josh’s next book, Pirasaurs!. Based on his other books, I know it will be a good one! Kellee’s Review: The books I find myself gravitating towards and recommending the most are the books that I not only love as a mother but can also definitely see the application of the book in all levels of classrooms. Dear Dragon fits into this category because it is such an amusing and fun book that is just a blast to read and discuss; however, it also has so many ways that I can see myself and other teachers using it in the classroom: for a mentor text, for a pen pal unit, for a read aloud. Dear Dragon also is an amazing set up to discuss first impressions and differences between people in safe place (since, you know, Blaise is a dragon). I also loved the quirky, colorful, detailed illustrations that accompany George and Blaise’s letters. The silly conversations just from these will make for a wonderful conversation. Teachers’ Tools for Navigation: Ricki fondly remembers her elementary school experiences with pen pals. Her fourth class wrote to a class in Germany. It was so interesting to learn about all of the differences between our lives. This book would make for a great jumpstart to a pen pal project. It would be neat to connect to a class in another country or even across our own country. Students would learn a lot about how we are both similar and different from others—and how this is a good thing, indeed! 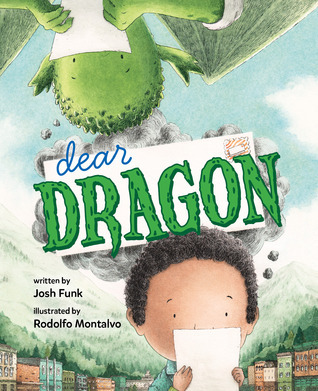 In addition to being a ton of fun, Dear Dragon will also be a perfect mentor text for a variety of reading skills and standards. The letters are a perfect opportunity to discuss point of view, voice, letter writing, and rhyming. The book also has a wonderful theme, the illustrations and letters could be compared/contrasted, and the entire text structure could be analyzed. Discussion Questions: What are the similarities and differences between George and Blaise? How do they build their friendship across letters? ; How do they each misinterpret the other’s letters in ways that are funny and enlightening? 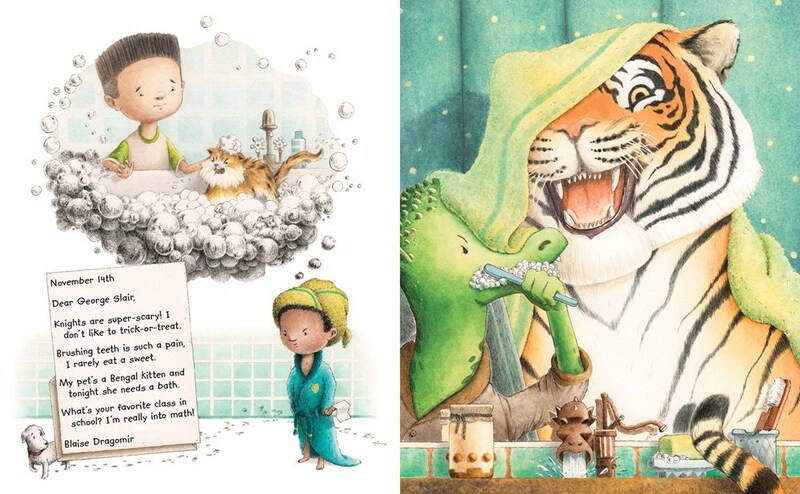 How do the illustrations reflect these misinterpretations? ; This book is a fantasy, but how might you compare this book to real life?